Awhile back, I wrote a post about the difference between PLM lighting systems . Today, I am so excited to share the next part of the series, Studio Lighting: Einstein vs Alien Bee 400! The best word to describe the beginning of my studio lighting journey would be confused. I spent countless hour searching the internet and chatting with other newborn photographers about the “best” lighting systems available. Einstein was one, Alien Bee 400 was the other. The price different was significant, and since I was just starting to build my business from hobbyist to professional, I couldn’t quite justify the price tag of the Einstein, so I happily purchased the Alien Bee 400. I have been using the Alien Bee 400 from Paul C Buff for 4 years now. I have moved 4 times, and while my PLM system’s have changed with each location, my light has not! It really has been great, but part of me has wondered if all the Facebook forums out there were right? Is the Einstein a “life-changer”? Will my images be “that much better” with just the switch of a light? I had used an Einstein before, but never done a side by side comparison! 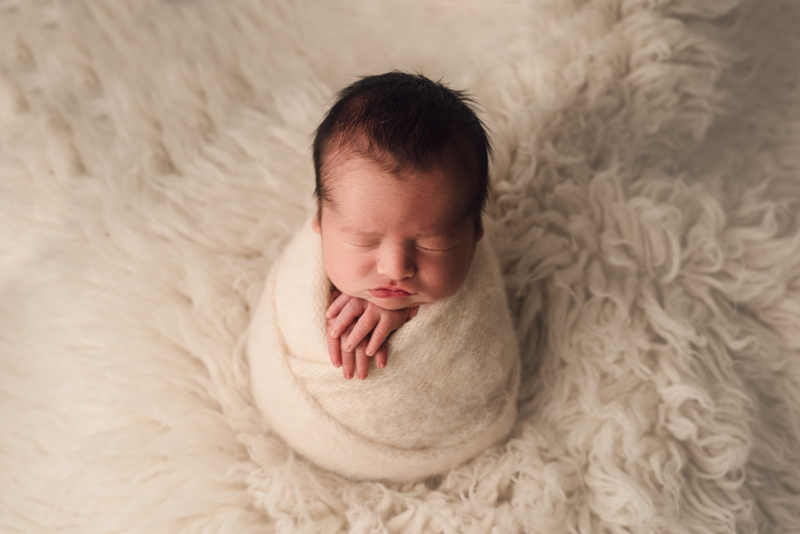 So, after talking with my fabulous friend and fellow newborn photographer, Ashley with Art by Ashley Photography we decided to put it to the test! Our goal was to photograph a newborn on a couple different sets test each light on each set. We set up each light with a 64″ White PLM with black outer cover and white diffusion fabric and got started! My “controls” – Nikon D610, Sigma 50 1.4 ART , F2.8 SS 1/160 White Balance K5560 ( I normally shoot at K5000 but forgot to change it back from an outdoor shoot so I just kept it there). I did adjust the ISO a couple times from 100-160. First, I am going to share some final images. These have all been edited exactly the same. They have had the same ACR adjustments and same editing in Photoshop. Can you tell which images were taken with which light? During the session, I would peek and see the images from the back of my camera. To my surprise, I couldn’t tell any noticeable differences in the back of camera preview. This made me even more anxious to get the images up on the computer! Let’s start with the first set of images we photographed. I was pretty surprised at the difference! Both of these images are straight out camera, no adjustments in Camera Raw, and both photographed at K5560. What do you notice first? The Alien Bee definitely photographs warmer and a bit more red. There is no question there! The Einstein has a bit of a yellow tint to it, but nothing crazy. The next set of images shows both images with the same exact ACR preset applied. This preset takes one click and done. The only additional adjustments I make normally are exposure adjustments. Now, what if I applied my same Camera Raw adjustment but lowered the temperature and tint on the alien bee image to closer match the Einstein image? I made adjustments to all of my images and save presets so that my workflow is consistent. So, making this adjustment takes no additional time for me to do, some of these adjustments can even be made in camera with a lower Kelvin temp and camera setting adjustments if you wanted. Here is the final images with the original adjustments. Which do you prefer? Here is the final image with the additional adjustments made to the Alien Bee image. I feel like color wise, these images match up pretty dang close! Let’s move on to another image! Now, knowing that I need to make a couple additional adjustments to my images in camera raw, I use my preset on both. Can you see any noticeable differences? What about in the final images? So, what’s the verdict? Which Studio Lighting is best? For years now, I’ve read how people’s lives have been changed from switching from the Alien Bee to the Einstein, and there are definitely some differences! The Alien Bee definitely gives off a warmer tone with a red hue while the Einstein does not. The differences were easy to change in Camera Raw. I wouldn’t deliver the Straight out of Camera Images to my clients, and I would be making adjustments of some sort to both. The Einstein is an amazing light, it is simple to use, it offers the ability to shoot at wide open apertures (although we did not get to test this feature), and if you are shooting at a rapid speed, the color is slightly more consistent than the Alien Bee. It has a slower full recycle time than the Alien Bee at 1.7 seconds. Total cost for the Einstein 640 is $499+shipping. The Alien Bee 400 is a workhorse. It’s light, easy to set up, it has simple features, with the light’s power being controlled by a slider. Recycles quickly at .5 seconds. However, if you are wanting a strobe for outdoor use, this light is not quite powerful enough. Total cost for the Alien Bee is $224+tax. So, will I be rushing to order an Einstein anytime soon? I don’t think so. Do I regret not shelling out the extra cash for the Einstein at first? Absolutely not. I would love to know YOUR thoughts? Are you surprised at the difference? Based on these results, do you feel like the Einstein is the way to go? Meet Amanda – the owner of Sweet Hadley B Cookies – A local Greensboro Small Business that creates custom decorated sugar cookies that are works of art! Amanda is an incredible and gorgeous wife and mother of two, who also happens to make some of the most beautiful and amazing sugar cookies you have ever seen! I had the honor of getting to see Amanda in action and interview her for my new blog feature of other local small business’ here in the Greensboro, NC area! I loved getting to watch her impeccable attention to detail as she carefully worked on each cookie to make it perfect! – How long have you been baking? – What got you interested in cookie decorating? I wanted to be able to make treats for my kids’ birthday parties and to send to school. I ordered from Etsy and after a let down experience, I decided to try it. After lots of research, watching YouTube, and following blogs for a couple months, I tried decorating my first cookies in December 2015. It grew from there as friends and acquaintances started ordering and referring people to me. I’m super blessed with supportive friends and customers and word of mouth is still my best advertising! – What was your inspiration for your business name? I started baking for my kids – so I wanted to incorporate them into my business name. Hadley is my daughter and we call my son, Barrett, B. That’s how Sweet Hadley B Cookies was born. – What was your favorite set of cookies you’ve created so far? Oh gosh, that’s so hard!! I really do love almost every set I get to create. If I have to pick just one though, I think it may be The Very Hungry Caterpillar hand painted set. – Go to drink/snack when you are working? Hot tea drinker here! Typically Irish Breakfast or Earl Grey. I don’t really snack while decorating because it would just mean more hand washing! – What is your biggest challenge for your Greensboro Small Business? Currently, I’m growing bigger than I can accommodate. It’s absolutely an amazing ‘problem’ to have. My youngest is still in preschool and I try to limit decorating to when he’s not home or after bedtime. Each year, as we add one day of pre-k, I’m able to take on more and more orders. – What does your creative process look like? My favorite sets are always when a customer sends me an invite and lets me be creative. I feel like those always turn out the best. Typically, I plan a set out on paper as far as cutters, colors, and designs. Sometimes I’ll sketch it out if I’m having trouble envisioning it, but most of the time I’m more of a wing it creator. – How can I place an order/what does the order process look like? You can place orders through a message to me on my Facebook page or a request form on my website (www.sweethadleyb.com). I’ll ask for the event date and what themes/ideas the customer has for the event. I check my availability, send pricing information and we go from there. Since each set is completely custom, it takes some back and forth to get a solid plan. Once a plan is made, I send an invoice, collect a retainer and we’re set! I snagged a few photos from her Facebook page of some gorgeous sets of cookies she has created, look how incredible they are?! 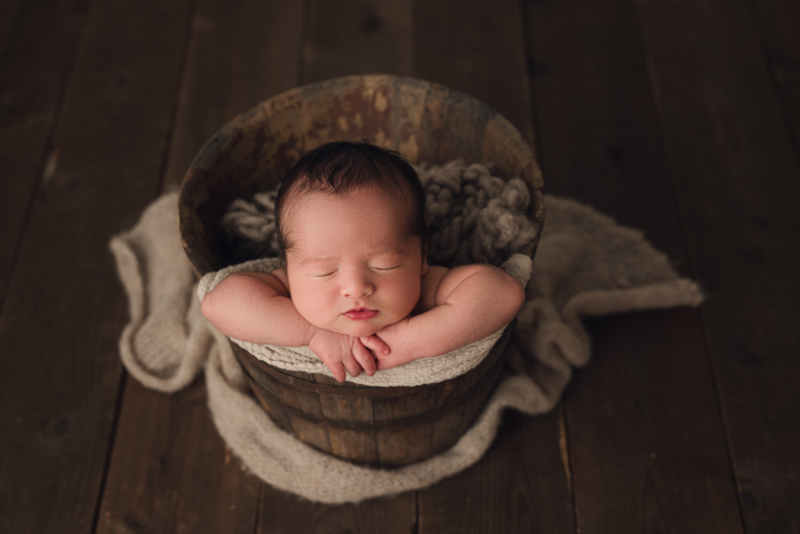 Oak Ridge NC Newborn Portraits – Baby Boone. I fell in love with Baby Boone’s fall themed newborn session! It was so fun coordinating with Boone’s mom to create sets that fit her home decor and her new baby boy’s nursery, all while still keeping some of my favorite neutrals in play! Doesn’t Boone look exactly like his big sister! I couldn’t believe how much they looked alike! Of course, since it’s Fall, we had to add in some mini pumpkins! Boone’s mom brought in this adorable customized hat in Buffalo Plaid! I got to use my newest prop for Boone’s session! Isn’t this little wire bed from TFJ Designs so cute? I mean… just look at those cheeks!! Is he not just perfect!? 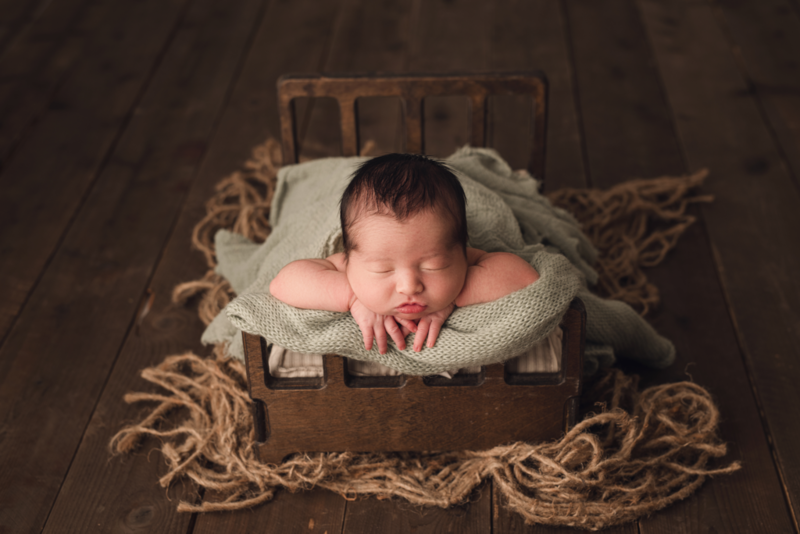 Stokesdale NC Newborn Photography – Baby Emarie was just an absolute delight to photograph! I couldn’t get over her perfectly squishy cheeks and long, gorgeous lashes that seemed to go on for days! I loved getting to use all the creams and soft blush colors! They really made all of her pretty features stand out! I’m a sucker for some babies breath! I knew I had to find a way to add these to one of the sets! Seriously… Could she be any more beautiful? This layering piece from TFJ Designs is one of my favorites for baby girl sessions! High Point NC Milestone Photography. Oh Whitt! Your smile is contagious! Your squishy cheeks can brighten anyone’s day, and being your Aunt is pretty dang awesome! I’ve been lucky enough to photograph Whitt since he was born, and now for his 6 month session! I cant wait to photograph you again at your cake smash! I have a feeling its going to be pretty epic! Six to Nine Months is my favorite age for babies! I think you can see why! Whitt’s smile sure is contagious! Take a look at those little teeth! This jute layer from Luneberry is one of my favorites! @2016 Greensboro NC, Winston-Salem NC and Triad Newborn & Baby Photographer|ProPhoto5 WordPress Theme | Designed by That's Kinda Cool!